Ondine Achampong on the podium at the British Championships in Liverpool. A talented young gymnast from Hemel Hempstead last month became a triple British champion at a major gymnastics event in Liverpool. Ondine Achampong, of Hemel’s Sapphire School of Gymnastics, claimed top spot in the hotly-contested junior all-around category at the 2019 Artistic British Championships at Liverpool’s M&S Bank Arena. The Hemel Hempstead School student also took gold on the uneven bars and beam, tallying an impressive three gold medals over the weekend. 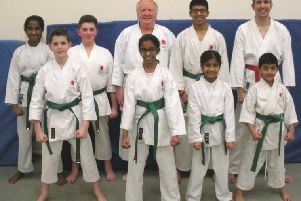 The 15-year-old, who lives in Kings Langley, said: “It feels great to be British champion because I’ve worked so hard, so to see my efforts payoff is brilliant. “Getting to compete in the finals with all of my friends has also been a real highlight for me. 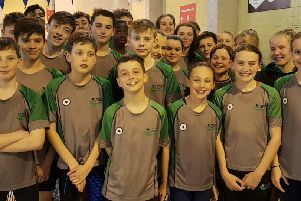 The major event saw 490 participants from 91 clubs take part in the four-day event, with youngsters travelling from across the UK. The age of the gymnasts ranged from 11 to 33 years old. Competitors also included the five-time Olympic medallist and Hemel Hempstead-native Max Whitlock, who successfully defended his British pommel horse title. The gymnasts performed in front of a packed arena in Liverpool, with the competition also broadcast live on the BBC.